Have you ever had the experience where an art technique seems just out of your reach? 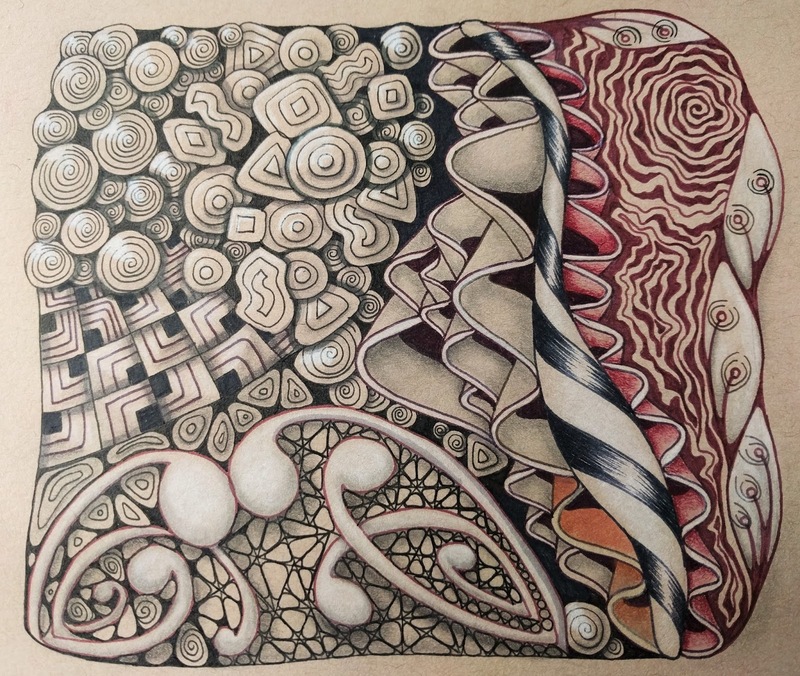 I feel that way every time I see a Zentangle renaissance tile where the tangler has artfully mixed black, brown, and red ink with shading and highlights on that mid-toned tan paper. I have made quite a few attempts with frustrating results. I just couldn't seem to achieve the effect I so admired. I was feeling really stumped! Recently I remembered a technique called "copy-cat" that can be used to accelerate the process when you want to learn something new. I was introduced to this technique in the context of learning new languages, but learning accelerators are techniques that can be applied to any kind of learning. So why not apply it to art? "To acquire real competency, your training must involve seeing effective performance, and duplicating it until you have it down." First I gathered examples of renaissance tiles that I admired or that had an effect I want to learn how to achieve, and I saved them to a new Zentangle Renaissance Tiles Pinterest board. Then I started trying to identify what it is that makes these particular tiles so intriguing and engaging. This was the "seeing effective performance" step. 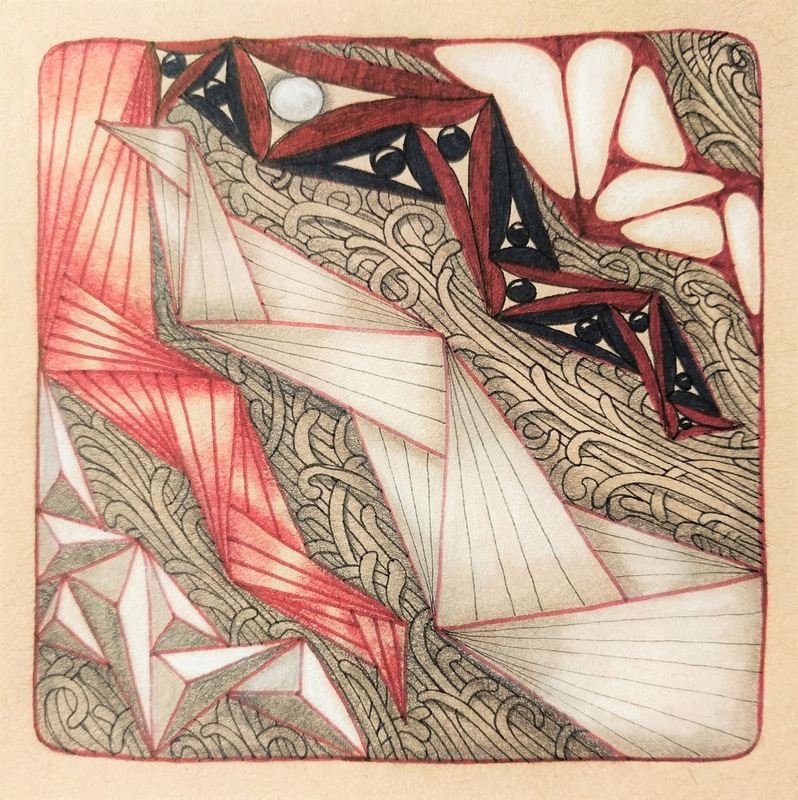 I noticed that I really liked white highlights that popped, that I liked the contrast of the red/brown ink against the black, especially when used within the same tangle, and that I liked the tiles where red/brown shading accented red/brown ink. The next step in this using this technique to accelerate learning would be to attempt to duplicate a few of my favorite parts of these tiles until I felt like I was able to recreate the results I so admired. This is a step that I can return to again and again to deepen my understanding. If you want to try this yourself, why not try CZT Adele Bruno's tangle Sand. Her step-out shows an example on a renaissance tile. A perfect way to get started! 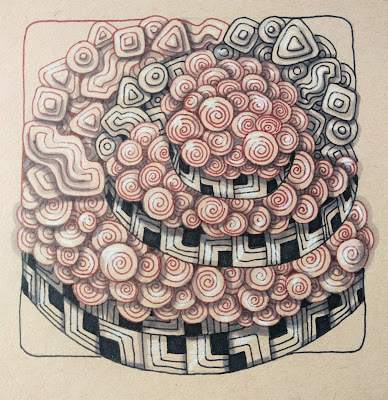 Next I gave myself a whole page in my tan sketchbook to create some tangles, make mistakes, and hopefully discover some successes, continuing to try to copy-cat the techniques I observed but applying them to a variety of patterns. In this practice page, I want to especially call out the El Prado by CZT Maria Tovar because here I am using a version inspired by The Ragged Ray. Copy-cat two ways! My practice page helped me see what combinations of ink color, chalk pencil, and graphite or colored pencil shading I liked best out of my experiments. So I continued to practice those combinations in this week's challenge tiles. This week the Diva challenged herself (and us!) 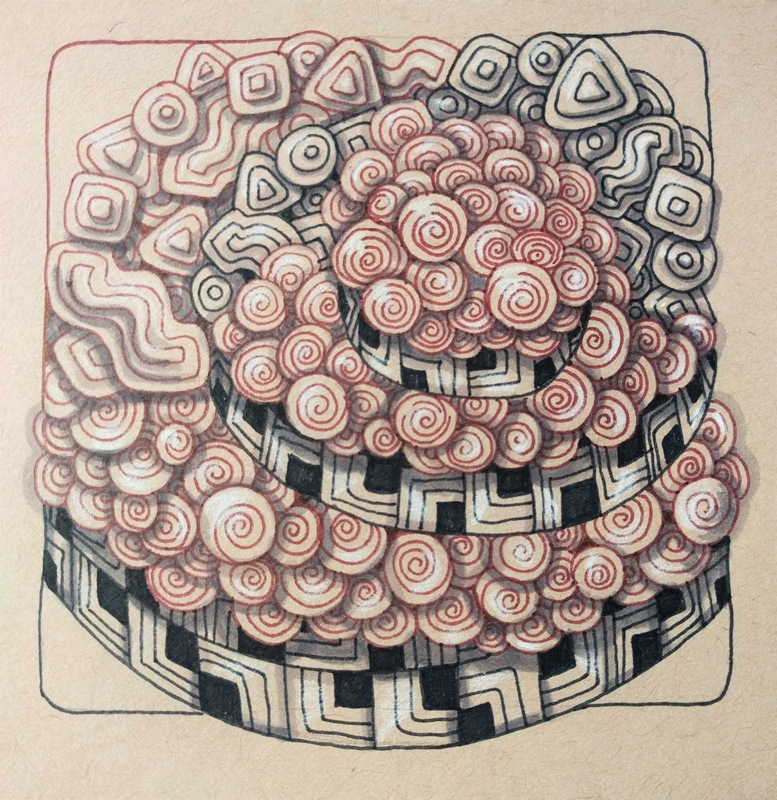 to get more familiar with the geometric tangle ING. I filled the triangular spaces of my ING spires in different ways and put a Fleavy-inspired background behind it. This week's challenge was to use Printemps, Partay, and Palrevo in a double-lined spiral string. I decided to use the aura'd variation of Partay that CZT Margaret Bremner showed when introducing the tangle and to mix it in with the overlapped Printemps. I used the grid-based Palrevo in the spaces created by the double-line of the string. I think it looks a bit like a layer cake! p.s. I love comments and do my best to respond to every one. So if you leave a comment, please click the box marked "Notify Me" to make sure you see any replies! Oh Julie, your two "challenge" tiles are beautiful and the colours are stunning. You have a lot of talent and I like reading your articles. This is very interesting because me too, have not much experience in drawing on tan tiles and have to learn more, thank you for sharing and the page in your scetchbook is great!!! Ria, your sweet comments always make me smile, and I so appreciate your encouragement! I think I started to dream in renaissance tile colors the other day after working on them for so long, hehe. Thank you for reading! Hi Julie! Let me first say that I LOVE your colors and your tiles. You seem to naturally bring in contrast where some people really struggle with that. I wanted to share that the "red" you perceive, typically is actually a sepia brown. It just photographs more reddish, or maybe shows up reddish with the other colors used (typically black, white and gray on the tan background) But, if you go to purchase the color in a Sakura Pigma micron, buy the brown (which is a lovely sepia color) vs the sepia (which is actually a dark brown) I know cause i bought a multi pack of the sepia only to be discouraged it wasn't the color I had hoped for. But hey, the darker color is nice too for some projects. Thank you for your kind compliments, Betsy! I appreciate you sharing that info about the sepia/brown microns. 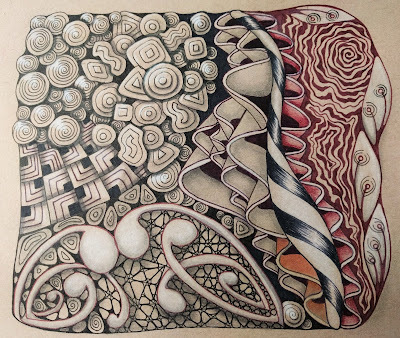 I think it's time for me to invest in the official Zentangle Renaissance Tile set! Thank you for sharing the explanation of that method. I think your work is very beautiful and the last one is my favorite. Thank you for the kind words, Anne. I'm glad you enjoyed this post!